Its looking dull here this morning. I am hoping that it brightens up just a little bit as I have tidying and sorting of the garage with a few trips to the tip planned. Mike is off today so I am going to make the most of him being around!! Hmmmm going to the tip on a Bank Holiday weekend is probably not the most sensible plan but it has to be done! This is a card that I made for my best friend Robyn and her husband. It is the first time I have coloured an image on Kraft and I have to say I coloured a couple more images yesterday so you will be seeing quite a lot more I think. I found that the pencils blended really easily into the cardstock. The image is from Forever Friends Springtime set along with the sentiment. Seam binding, twine and button from stash. 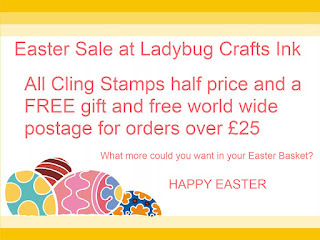 Before I go and make a start I just need to tell you that there is 1/2 price sale on all cling stamps at Ladybug Crafts Ink . 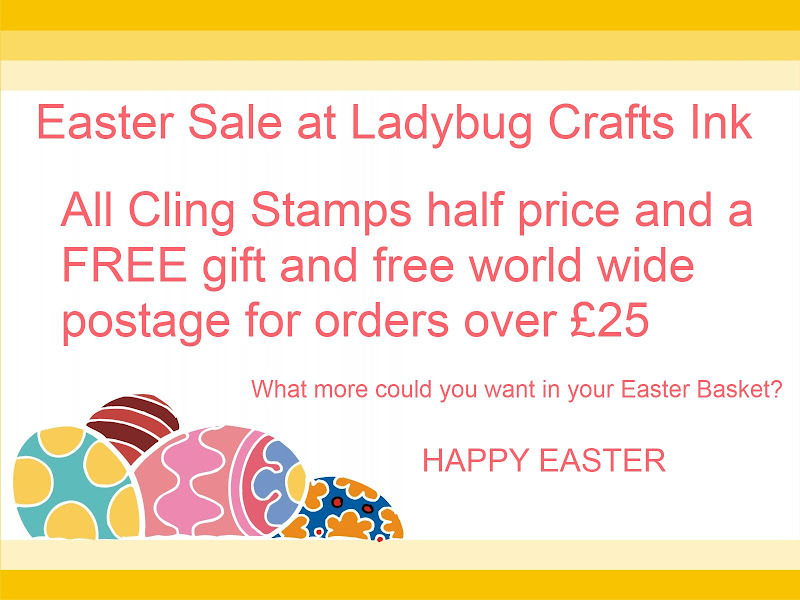 You have until 17th April to grab a bargain. Hello to my new followers, glad you are here. WOWSERS Sally I love that effect! Cute image and fabulous card made to perfection! gorgeous card Sally! i must have a go with kraft, happy easter! Wow Sally your card looks gorgeous. The pencils on kraft look amazing. How cute!! Thanks for joining us this week at Dilly Beans Challenges! That is brilliant Sally! Gorgeous colouring on kraft - I wanna see more of your cards with that!! Hope poor Mike gets a well deserved rest after your to do list today!! I think that's the most darling image, Sally, and I love how you colored it! Great ribbon and bow and love the CAS lines! Gorgeous project Sally. Happy Easter to you. Thanks for joining us at Crafts4eternity.